Recently during several weeks in the Southwest we enjoyed wonderful Mexican food. My favorite was an authentic taco stand with a sidebar of wonderful condiments. In addition to the usual radishes there were fabulous, spicy, hot pickled veggies. To the blare of Spanish music and game shows on TV I loaded the condiments smothering an order of enchiladas. 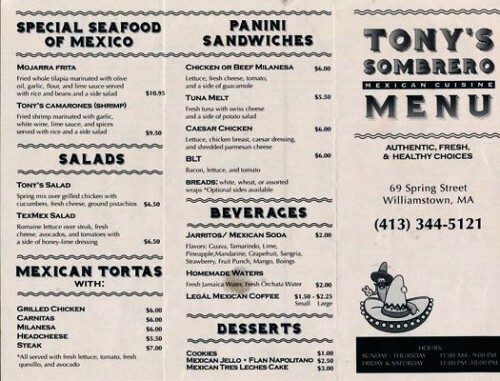 With just a half hour before a movie in Williamstown I tried Tony’s Sombrero on Spring Street. It occupies what had formerly been a popular ice cream stand. I entered with high hopes of a quick and tasty burrito. There was indeed a TV tuned to a Spanish statement. But I had difficulty attracting the attention of the suitably ethnic looking person behind the counter. He was totally absorbed with a cell phone and for at least ten minutes failed to acknowledge my presence. I saw my window of time shrinking. Looking about just before noon there were only a couple of customers in the small restaurant that emphasizes take out. 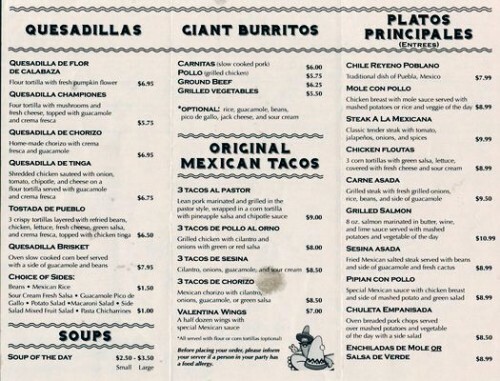 Perusing the enticing menu I decided on Tony’s Burrito. That should be fast and tasty. Placing my order I was asked for payment up front. At $8.50 plus tax perhaps he didn’t trust me. He wouldn't budge until I lined his palm with silver. That Williamstown crowd can be rough. Then he went back to another call. Hey. I paid you. What about making the friggin burrito! Running out of time and patience I informed him that I was in a hurry. That seemed to have little or no impact. Focusing on his call was way too important. Appearing from the back room a woman appeared and completed my order. By now I was down to just about ten minutes. The norm is for a burrito to come wrapped tightly in tin foil. Not in this case. It was sliced at a diagonal. Picking it up the steamed wrapper was soggy and the ingredients were falling out. The whole thing was wet and sloppy with watery rice and beans and non descript other filling. Generous slathering of hot sauce saved the meal from being a complete disaster. Overall it was my all time worst and most disappointing burrito. 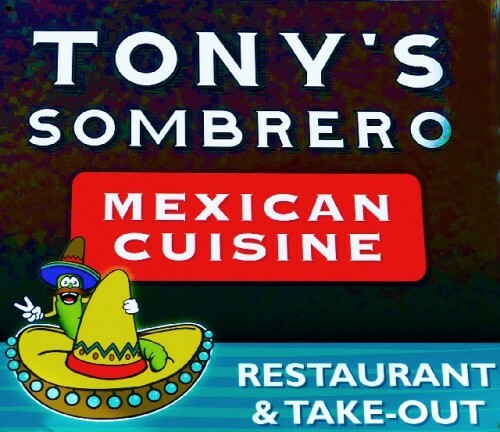 Given the utter indifference of management perhaps they might more aptly change the name to Tony’s Siesta. Trust me. I won’t be back.